Time travel, in light of our current knowledge, falls into the realm of science fiction. But the process of discovery is not fixed; our knowledge is always evolving, as is our understanding of the universe and our place in it. Science is beginning to find mechanisms that show time is not a one-way arrow. In fact, harnessing the power of faster-than-light speed quantum particles like the Higgs Boson, or the reverse-traveling neutrino might lead to applications in the material realm by further scientific breakthroughs and development of new technologies. Or maybe we humans will one day be able to travel into the quantum realm—dematerialized and rematerialized—Star Trek-style. Still, time travel exists even today through our own mental powers. We do it all the time: imagine ourselves getting into our dream school. Put ourselves back into our childhoods. In dreams or imagination, we can become whatever we want to be. There is no workable time machine. Yet. Will there be? We can dream. Charley is a dreamer with a passion for fact. When discovering science fact and science fiction, what we know today to be true may someday be turned upside down. We've always had ways to travel through time. From earliest times, story has been the way to see what's ahead, or review what is done. It is very difficult to live in the present. Neuroscientist Dr. Marcus Raichle, who was a pioneer in detecting the many brain channels interacting across networks to synthesize and coordinate information, calls the brain a "prediction machine." It draws on an outline of information from a low-resolution sensory download and communication across brain networks to revisit what it's likely to see in the future. As Dr. Raichle says, the brain is intrinsically organized in space and time. So we have a story based on a patchwork of past experiences that helps us predict what might happen in the future. A story that may or may not bear out, but one that can definitely shape our expectations, how we decide, and how we interpret events. But since this is only inside our heads, we might also decide to see past events differently to make different decisions or respond with more conscious thought. It is this kind of "seeing things differently" that guided Leonardo da Vinci in his day, and guides the inventors, artists and scientists today to see new possibilities and "invent the future." We do have that power—to be the boss of our own brains—instead of reacting in the same old ways to life’s challenges and expecting things to change. In seeing ahead, stories are a kind of rehearsal space to imagine what we might do in a certain situation, or preview solutions to problems. Remembering, we may learn from situations we’ve already confronted, for better or worse—a way to get a do-over. So let us know what stories you’re telling yourself. Are you the boss of your brain? 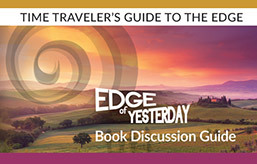 Our Edge of Yesterday Teachers' Guide is now available!